Letter 55 is retroactively dated Saturday January 13, 2001. 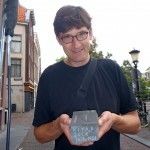 The Letter was made in April or May 2012 by Rinus van den Belt was placed in the street by Arie en Denis Koot on May 30, 2012. 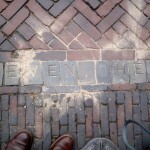 The inscription in the side of the stone was made by Michael Münker on September 7th, 2013.